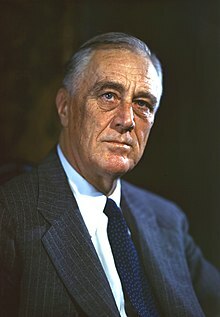 Franklin Delano Roosevelt ( /ˈroʊzəvəlt/ ,  /-vɛlt/ ;  January 30, 1882 – April 12, 1945), often referred to by his initials FDR, was an American statesman and political leader who served as the 32nd president of the United States from 1933 until his death in 1945. 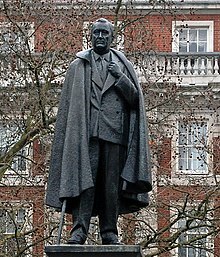 A Democrat, he won a record four presidential elections and became a central figure in world events during the first half of the 20th century. 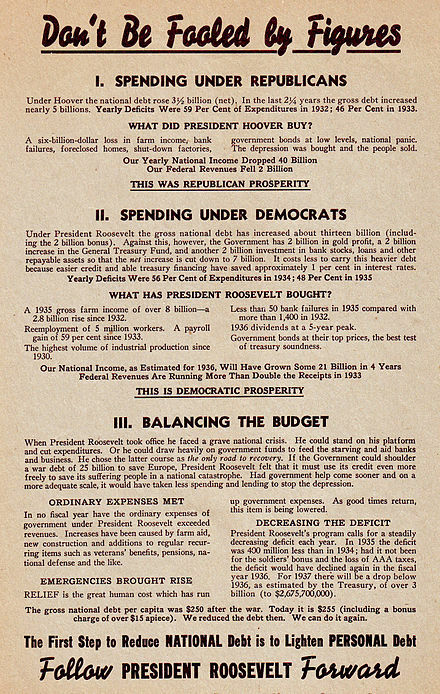 Roosevelt directed the federal government during most of the Great Depression, implementing his New Deal domestic agenda in response to the worst economic crisis in U.S. history. 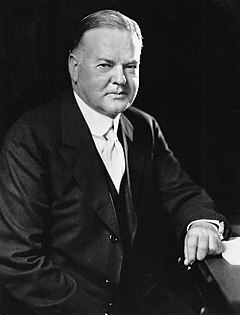 As a dominant leader of his party, he built the New Deal Coalition, which realigned American politics into the Fifth Party System and defined American liberalism throughout the middle third of the 20th century. 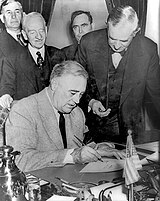 His third and fourth terms were dominated by World War II. 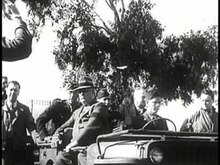 Roosevelt is widely considered to be one of the most important figures in American history, as well as among the most influential figures of the 20th century. Though he has also been subject to much criticism, he is generally rated by scholars as one of the three greatest U.S. presidents, along with George Washington and Abraham Lincoln. 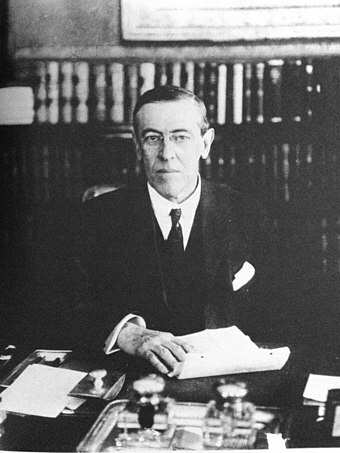 James Roosevelt I, known as "Squire James", was an American businessman and horse breeder, and the father of American President Franklin Delano Roosevelt. William Henry Aspinwall was a prominent American businessman who was a partner in the merchant firm of Howland & Aspinwall and was a co-founder of both the Pacific Mail Steamship Company and Panama Canal Railway companies which revolutionized the migration of goods and people to the Western coast of the United States. 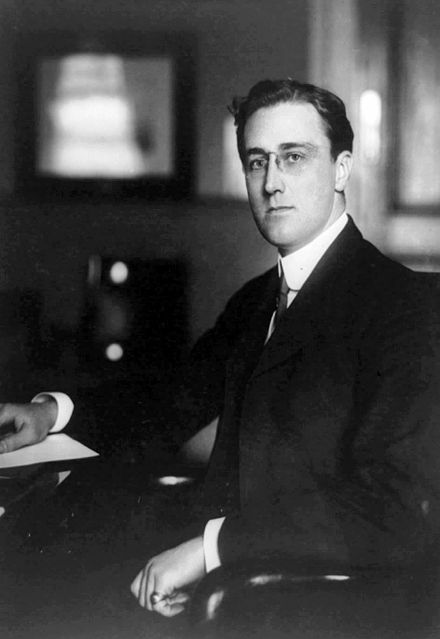 Jacobus "James" Roosevelt III was an American businessman and politician from New York City and a member of the Roosevelt family. 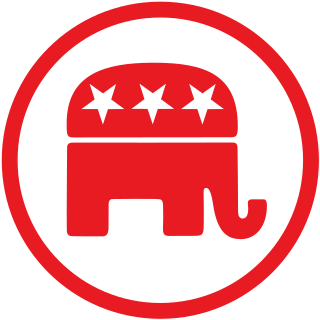 Bourbon Democrat was a term used in the United States in the later 19th century (1872–1904) to refer to members of the Democratic Party who were ideologically aligned with conservatism or classical liberalism, especially those who supported presidential candidates Charles O'Conor in 1872, Samuel J. Tilden in 1876, President Grover Cleveland in 1884–1888/1892–1896, and Alton B. Parker in 1904. 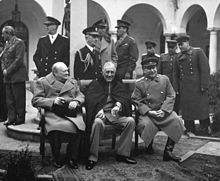 On March 29, 1945, Roosevelt went to the Little White House at Warm Springs, Georgia, to rest before his anticipated appearance at the founding conference of the United Nations. On the afternoon of April 12, Roosevelt said, "I have a terrific headache." He then slumped forward in his chair, unconscious, and was carried into his bedroom. The president's attending cardiologist, Dr. Howard Bruenn, diagnosed the medical emergency as a massive cerebral hemorrhage. 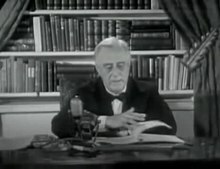 At 3:35 p.m. that day, Roosevelt died at the age of 63. Roosevelt's home in Hyde Park is now a National Historic Site and home to his Presidential library. Washington D.C., hosts two memorials to the former president. The largest, the 7.50-acre Roosevelt Memorial, is located next to the Jefferson Memorial on the Tidal Basin. A much more modest memorial, a block of marble in front of the National Archives building, was erected in 1965. Roosevelt's leadership in the March of Dimes is one reason he is commemorated on the American dime. 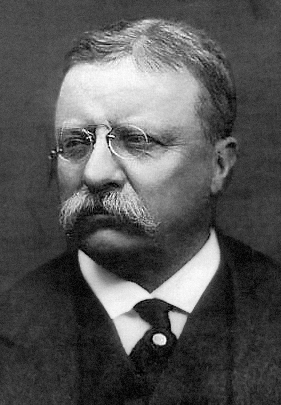 Roosevelt has also appeared on several U.S. Postage stamps. The Franklin Delano Roosevelt Memorial is a presidential memorial in Washington D.C., dedicated to the memory of Franklin Delano Roosevelt, the 32nd President of the United States, and to the era he represents. For the memorial's designer, landscape architect Lawrence Halprin, the memorial site represents the capstone of a distinguished career, partly because the landscape architect had fond memories of Roosevelt, and partly because of the sheer difficulty of the task. 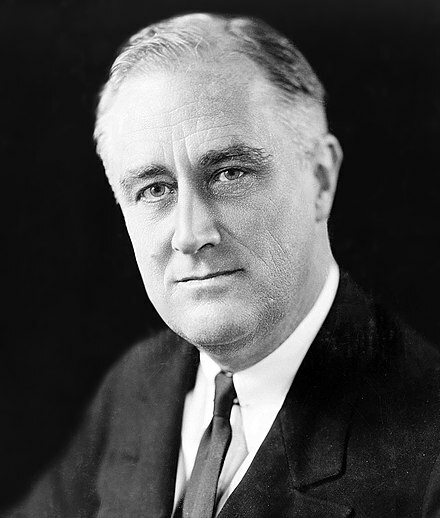 Franklin Delano Roosevelt Jr. was an American lawyer, politician, and businessman. He served as a United States Congressman from New York from 1949 to 1955, the first chairman of the Equal Employment Opportunity Commission from 1965 to 1966, and ran twice for Governor of New York. 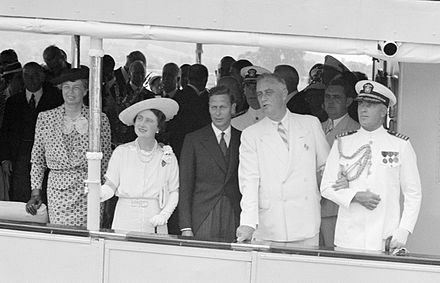 Roosevelt was also a son of President Franklin D. Roosevelt and First Lady Eleanor Roosevelt, and served as an officer in the United States Navy during World War II. Lucy Page Mercer Rutherfurd was an American woman best known for her affair with future US President Franklin D. Roosevelt. 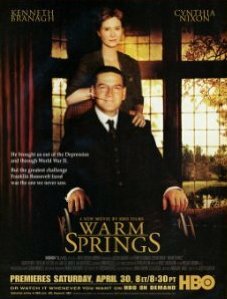 Warm Springs is a 2005 television film directed by Joseph Sargent and starring Kenneth Branagh, Cynthia Nixon, Kathy Bates, Tim Blake Nelson, Jane Alexander, and David Paymer. 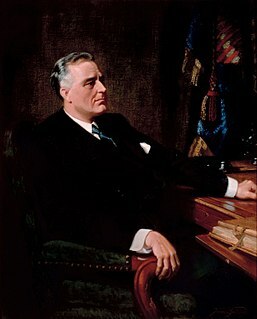 The screenplay concerns U.S. President Franklin D. Roosevelt's 1921 illness, diagnosed at the time as polio, his struggle to overcome paralysis, his discovery of the Warm Springs resort, his work to turn it into a center for the rehabilitation of polio victims, and his resumption of his political career. 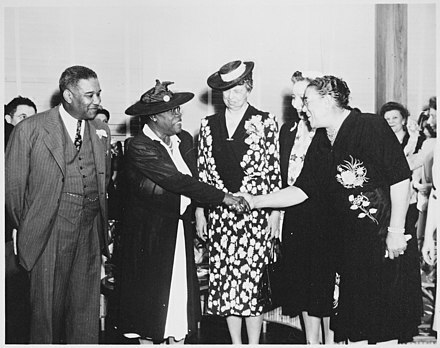 Roosevelt's emotional growth as he interacts with other disabled people at Warm Springs prepares him for the challenges he will face as President during the Great Depression. 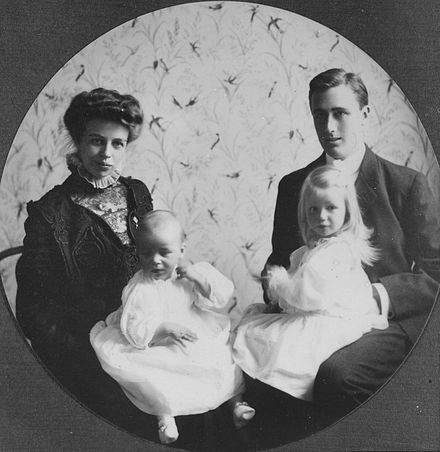 Sara Ann Delano Roosevelt was the second wife of James Roosevelt I, the mother of President of the United States Franklin Delano Roosevelt, her only child, and subsequently the mother-in-law of Eleanor Roosevelt. 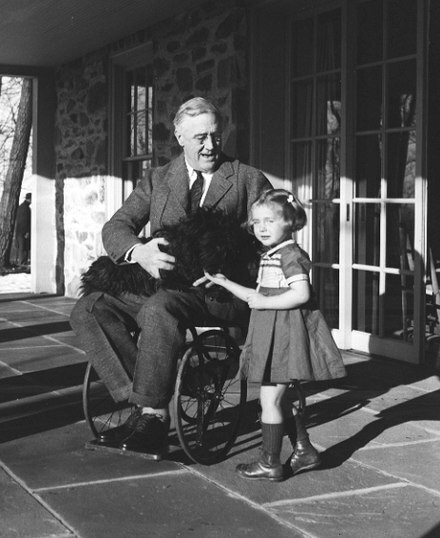 Fala, a Scottish Terrier, was the dog of U.S. President Franklin D. Roosevelt. One of the most famous presidential pets, Fala was taken many places by Roosevelt. 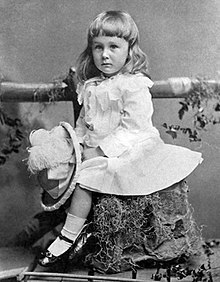 Given to the Roosevelts by a cousin, Fala knew how to perform tricks; the dog and his White House antics were mentioned frequently by the media and often referenced by Roosevelt and his wife Eleanor. 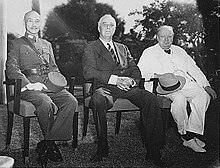 Fala survived Roosevelt by seven years and was buried near him. 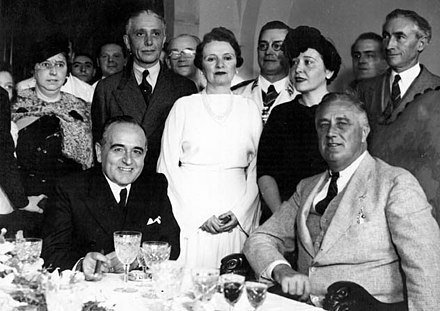 Marguerite Alice "Missy" LeHand was private secretary to U.S. President Franklin D. Roosevelt (FDR) for 21 years. According to LeHand's biographer, Kathryn Smith, in "The Gatekeeper," she eventually functioned as White House chief of staff, the only woman in American history to do so. William Edward Leuchtenburg is the William Rand Kenan Jr. professor emeritus of history at the University of North Carolina at Chapel Hill. He is a leading scholar of the life and career of Franklin Delano Roosevelt. 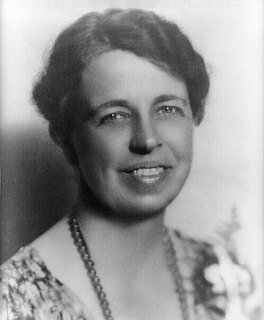 Grace Tully was private secretary to U.S. President Franklin D. Roosevelt (FDR). Eleanor and Franklin: The White House Years is a 1977 American made-for-television film and a sequel to Eleanor and Franklin (1976). Originally airing on March 13, 1977, it was part of a two-part biographical film directed by Daniel Petrie based on Joseph P. Lash's Pulitzer prize-winning biography chronicling the lives of the 32nd U.S. President and the first lady. Joseph Lash was a secretary and confidant of Eleanor and wrote other books on the couple. 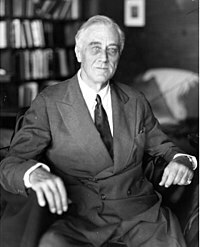 This Bibliography of Franklin D. Roosevelt is a selective list of scholarly works about Franklin D. Roosevelt, the thirty-second President of the United States (1933–1945). 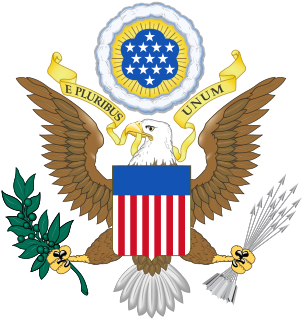 The 1940 United States presidential election in Arkansas took place on November 5, 1940, as part of the 1940 United States presidential election. Arkansas voters chose nine representatives, or electors, to the Electoral College, who voted for president and vice president. 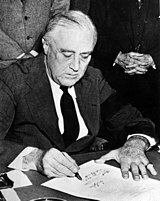 The third and fourth terms of the presidency of Franklin D. Roosevelt began on January 20, 1941, the date of Roosevelt's third inauguration, and ended with Roosevelt's death on April 12, 1945. 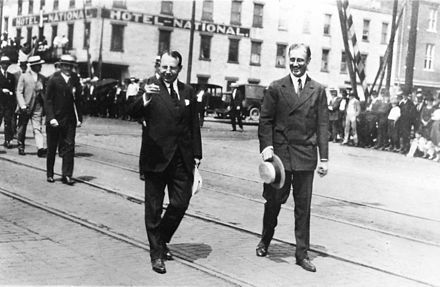 Roosevelt won a third term by defeating Republican nominee Wendell Willkie in the 1940 United States presidential election. He remains the only president to serve for more than two terms. 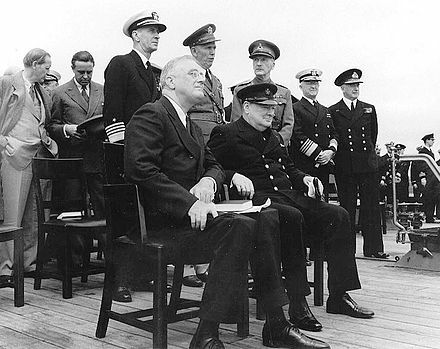 Unlike his first two terms in office, Roosevelt's third and fourth terms were dominated by foreign policy concerns, as the United States became a belligerent in World War II in December 1941. 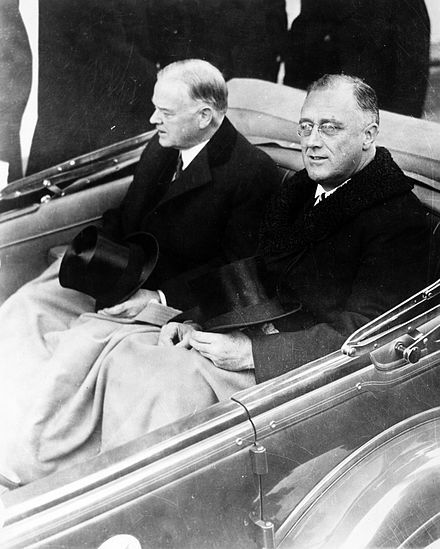 ↑ President Franklin Roosevelt 1933 Inauguration. C-SPAN. January 14, 2009. Retrieved July 24, 2017– via YouTube. ↑ Hausman, Joshua K. (April 2016). 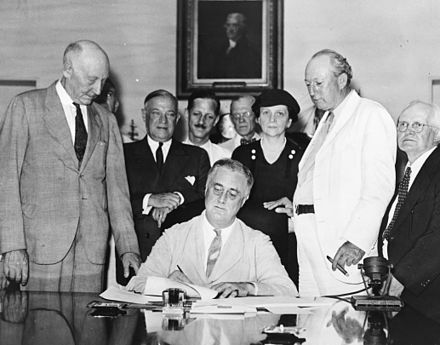 "Fiscal Policy and Economic Recovery: The Case of the 1936 Veterans' Bonus" (PDF). American Economic Review . 106 (4): 1100–1143. doi:10.1257/aer.20130957. ↑ Belknap, Michal (2004). The Vinson Court: Justices, Rulings, and Legacy. ABC-CLIO. pp. 162–163. ISBN 9781576072011 . Retrieved March 3, 2016. ↑ Maher, Neil M. (July 2002). "A New Deal Body Politic: Landscape, Labor, and the Civilian Conservation Corps" (PDF). Environmental History . 7 (3): 435–461. doi:10.2307/3985917. JSTOR 3985917. 1 2 Margo, Robert A. 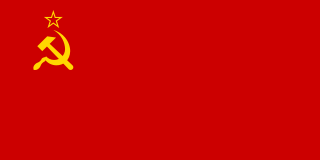 (Spring 1993). "Employment and Unemployment in the 1930s". Journal of Economic Perspectives. 7 (2): 42–43. CiteSeerX 10.1.1.627.1613 . doi:10.1257/jep.7.2.41. ↑ Charles, Douglas M. (Spring 2000). "Informing FDR: FBI Political Surveillance and the Isolationist-Interventionist Foreign Policy". 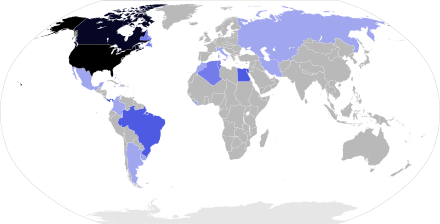 Diplomatic History . 24 (2): 211–32. doi:10.1111/0145-2096.00210. 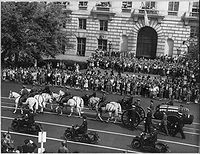 ↑ "President Franklin D. Roosevelt dies at 63 in 1945". New York Daily News . 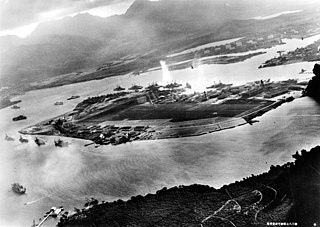 April 13, 1945. Retrieved December 29, 2017. ↑ Collins, William J. (March 2001). "Race, Roosevelt, and Wartime Production: Fair Employment in World War II Labor Markets". The American Economic Review . 91 (1): 272–286. doi:10.1257/aer.91.1.272. JSTOR 2677909. 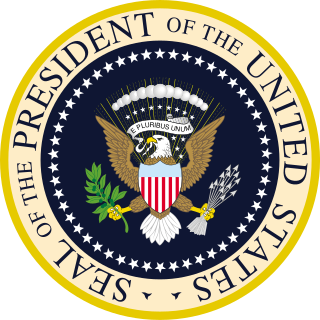 ↑ "Presidential Leadership – The Rankings". Wall Street Journal . Dow Jones & Company. September 12, 2005. Archived from the original on November 2, 2005. Retrieved May 4, 2015.